On December 14 2012, I saw this headline at the news-stand. Yes, my name is Sandy, and I know the headline referred to Hurricane Sandy. 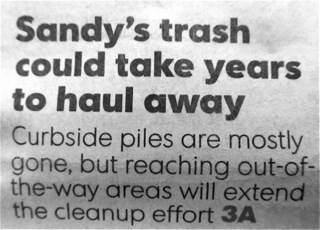 Still, it made me think — my trash could take years to haul away too. That’s when I knew I had to take more radical action to get through all the boxes of “stuff” that still litter my house and my life. That’s when I decided to start this blog. My first hoarder-blog project starts in the garage. I haven’t opened the utility closet in years. Well, maybe I did crack the door open far enough to lean in and swish away some of the spider webs, see if there was anything I could easily do about the accumulation of stuff, and quickly close the door again. The closet was full, so for the last few years I’ve stacked my paint cans on the floor outside the closet – paint from the past that I didn’t know what to do with, new paint that was the wrong color and couldn’t be used, paint I’d used and wanted to keep for touch-ups – all of it’s there, a rainbow history of the rooms of this house. If paint is usable, find someone who wants it. Recycling centers that accept paint. I look on Earth911 but find my local paint recycling company charges to take donations. I’m frugal enough that I want to donate for free, so I’m still doing my research. If it’s not usable, use a ‘paint hardener’ or kitty litter to dry the paint and make it acceptable to my trash company. Next project: get into that utility closet. On December 14 2012, I saw this headline at the news-stand. Yes, my name is Sandy, and I know the headline referred to Hurricane Sandy. Still, it made me think -- my trash could take years to haul away too. That’s when I knew I had to take more radical action to get through all the boxes of “stuff” that still litter my house and my life. That's when I decided to start this blog. Mainly my nerdy journey through Nutrition, Diets, Supplementation. From time to time Funny Facts and Surprising Science . Blog is mainly in English language and some of it in Dutch language .